Whether you're working in the Children's Department, subbing in there for a vacation, or maybe just thinking about becoming a librarian someday, it's always a good idea to have some storytime basics in your pocket, just in case you need them. 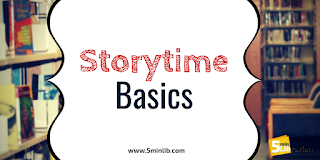 Now, everyone does storytime differently, and your ideas may vary wildly from what I do -- and that's okay! These basics are here to give you a good jumping-off point, so you're not overwhelmed by the thought of having several small faces staring at you. To theme, or not to theme? That is the question. The choice is yours; do you want all your books to be on the same topic, or just have a few books that you feel like reading that day? I've done it both ways, and it works both ways. Sometimes it's easier to pick out a book from the multitude of great options by deciding they all need to be about dinosaurs; sometimes you just really want to read some new ones you just learned about. To read, or not to read? Some libraries have storytime that no longer has stories! Instead, it's songs, dancing, music, and maybe some storytelling via felt board. Do whatever works for you! Are children enjoying the library? Well, that's one of the main ideas. When choosing books, I try to make sure they're not more than a sentence or two on a page for kids through preschool age. Many people use voices for different characters, but I am absolutely horrible at that, so I don't even try. I do, however, use facial expressions and emotions to react to what's going on in the story. Repeating the first and last songs of each storytime session helps children to recognize the patterns of the event. "Oh! We're singing 'If You're Happy and You Know It' so we must be getting started!" Interactive songs (with hand motions) are always a good way to get everyone involved in the program and ready to go. I usually start with "Mister Golden Sun," because it's just so cheerful. I generally sing a song or two between each book. Some librarians have lyrics written out or printed on sheets; I used to do this, but now I generally sing one line of a song and have them repeat it back to me, and we go through the song that way, and then once all together. You can add an extra element to your songs by introducing shaker eggs, scarves, or jingle bells. This is especially good if the kids are getting wiggly, as they encourage everyone to get up and dance! If you don't feel comfortable singing, pull out a CD player or an iPod. There is no shame in getting help from the pros! In addition to books and songs, many storytimes also include some extra elements, such as finger-plays, puppets, and felt-board storytelling. Many also have a craft or coloring sheets at the end. At my current library, I inherited the Guess Box. It's a small box with a hole in the lid; I put something inside and the kids have to guess (without peeking or pulling it out) what is inside. They LOVE the Guess Box. None of these are mandatory, and they're supposed to be fun, so if this just stresses you out, feel free to forego them. Always read the longest book first and the shortest book (or the one with a gimmick - the pop-up or the one with sparkly pages) last, when their attention span is waning. Vocabulary - Just by reading to children, you increase their vocabulary and reinforce words they have already learned. Print motivation - Reading is fun! What better place to learn that than by enjoying a visit to the library? Print awareness - Look at the words on this page! We can tell a story by reading them! Narrative skills - Being able to tell things in sequence to tell a story. What happened first? Letter knowledge - What letter is this? What sound does it make? Phonological awareness - What sound does this letter make? What word rhymes with CAT? They're good to know! But if you don't want to start working them into your storytime, don't despair - you probably already do it. When dealing with a group where parents get very chatty, I usually start by saying, "Parents, please make sure your little ones are paying attention! Kids, please make sure your grown-ups have their listening ears on!" Miss Kat Says put your hands on your belly! Miss Kat Says put your hands on your nose! Put your hands on your knees! Oooo - Miss Kat didn't say! Miss Kat says put your fingers in front of your mouth and quietly blow - SHHHHHHH. Great job! Let's keep going! Don't be afraid to just end the session early if you need to. Sometimes there's a day when nobody can sit still, nobody wants to pay attention, and it's just not working. If you've tried all your tricks and it's just A Day, feel free to say, "are we out of attention span for the day? Would we rather go play with the toys?" Remember - it's supposed to be FUN. If you decide to ask questions about the story, make sure you keep them closed-ended ("what color is this? "), because some preschoolers will tell you a whole story if you let them. If nobody answers, just pretend they did ("that's right! It's BLUE!") and keep moving along. Remember - if you mess up, nobody will care. Forget the words to a song? Laugh it off! Skip a page? Say, "whoops!" and keep going. Don't stress about it - this is supposed to be fun for you, too! 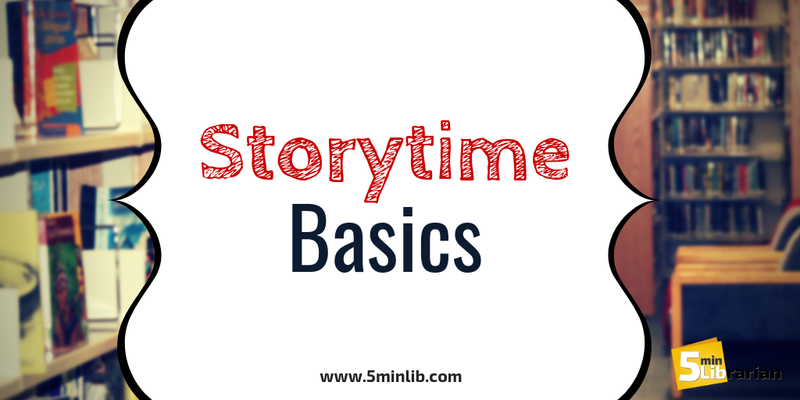 We hope this helps any storytime newbies out there! We'd love to hear what works for you. Tell us here in the comments, on our Facebook page, or on Twitter.